The Railway are delighted to report that longstanding working member, Chris Bates, has been awarded the MBE in the Queen’s New Year honours list. Chris joined the Railway in 1968 and in that time has put in many hours in various roles right across the Railway spectrum. 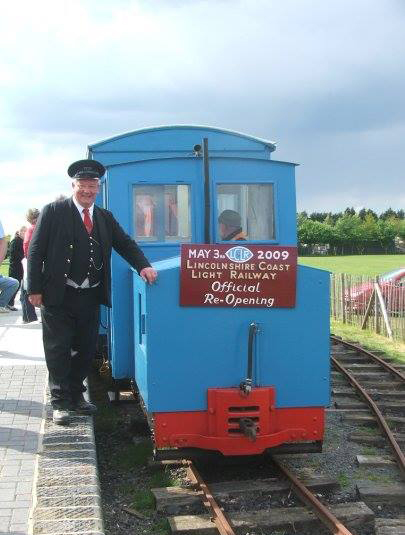 In addition to the KWVR, he has also been an active member of the Lincolnshire Coast Light Railway since 1961. However, now 66, and with an long history of service to the railway preservation movement, it is not his dedication to this, that has brought him such recognition. In the middle of the south Atlantic, 1,750 miles from Cape Town and 2,200 miles from Montevideo (Uruguay), lies the island of Tristan da Cunha, part of the UK Overseas Territory of St. Helena, Ascension Island and Tristan da Cunha. As such this volcanic island is officially the world’s most remote inhabited island. For the past 7 years, from his home in land-locked Birmingham, over 6,000 miles to the north, Chris has been the official UK representative of Tristan da Cunha, despite having visited the island, population of 267 and who share nine surnames between them, just three times. The Award of the MBE is “for services to the community of Tristan da Cunha in the UK and worldwide”. In Chris’s own words, “I have been the island’s unpaid UK Representative for the past seven years, acting as the voice of the islanders at meetings with politicians, ministers, civil servants and non-governmental organisations (especially those involved in conservation, as the island has two UNESCO World Heritage Marine Sites, putting it on a par with the Great Barrier Reef, the Galapagos, Florida Everglades etc). Although Chris’s MBE is not for his service to the KWVR, his ‘career’ on the Railway is well worth recording. Railways must run through the Bates’ vanes, coming from a railway family with father Geoff Bates and grandfather John “Percy” Bates signalmen on the Midland & Great Northern Joint Railway. In addition his wife, Julie was the Admin Assistant at Haworth Station for many years. He joined the preservation society at Easter 1968 at the behest of C&W volunteer Ken Roberts and the late Barry Herbert, the railway author, who was a member of both the KWVRPS and the Lincolnshire Coast Light Railway where he was also a volunteer, and took part in the “Timetable Trials” ready for the re-opening of the branch. In the early 1970s as part of the team operating the buffet car on service trains Chris became a regular volunteer and became a guard in 1977 – a role in which he is still active, 38 years later. From 1975 onwards he was Secretary of the Publicity Committee, working with a team who successfully staged media-focused events such the repainting of No. 30072 into US Stars and Stripes as “No. 1776”, renaming of “City of Wells” with the Mayors of Wells and Bradford, organising reunions of crews who had worked with GNR Atlantic “Henry Oakley” which had been loaned to the KWVR by the NRM. With the return to active service last year, interestingly, from 1975 onwards Chris was part of the team responsible for purchasing the USATC 2-8-0 5820 ‘Big Jim’ from Poland – first time a communist country had sold a loco to the West for preservation. The featured photograph shows Chris with wife Julie and son Rob at Keighley, on the 40th anniversary special which ran from Keighley to Ribblehead behind visiting LMS Jubilee, 5690 Leander, having been much involved in the events of 2008 to mark the 40th anniversary of re-opening of the branch. If membership of the KWVR and LCLR were not enough, he is also a member of various KWVR-related societies including Vintage Carriages Trust, Standard 4 Locomotive Society and the Bahamas Locomtive Society. 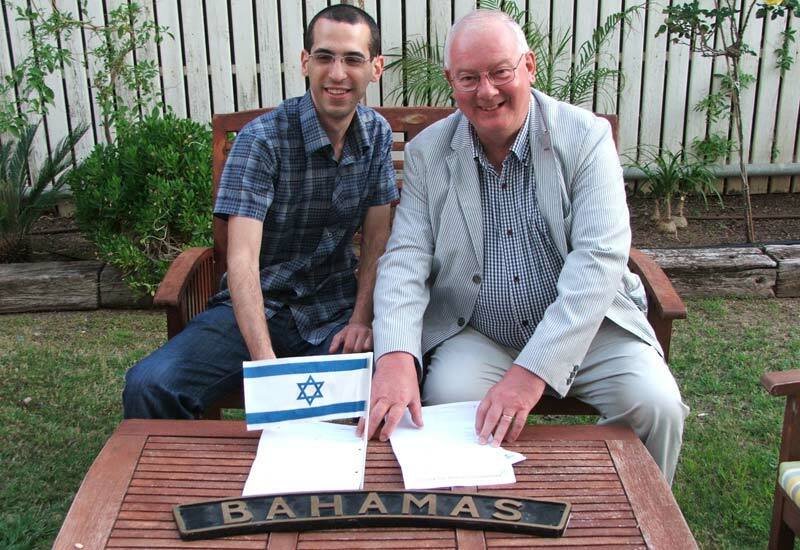 In 2010 he brought back to Ingrow a replica nameplate of the Jubilee 4-6-0 “Bahamas” from the Israel Railway Museum at Haifa, where it had been left to the society in the will of the late manager and BLS pioneer, Paul Cotterell. The photo shows Chris with the present manager of the museum, Chen Melling, at the handover ceremony at Nahariyya in Israel. Finally Chris found time to work in the “real world” – most famously as Tinky Winky’s spin doctor, but that is probably best left to the readers imagination. Chris now hopes to spend more time in his native county of Lincolnshire and his other railway interest, the Lincolnshire Coast Light Railway where he will be seen in typical guise as depicted in the photograph, as well as his volunteering role on the KWVR. Congratulations to Chris from everybody at the Keighley & Worth Valley Railway, and we look forward to featuring the presentation when that occurs later in the year.